A descendant of the Everlasting Dragons. The dragon was once a normal dragon, until his eternal hunger transformed his upper body part to a giant mouth. His fog gate is at the bottom of the huge open area, accessible when you turn right at the broken grille leading to Blighttown/Domhnall of Zena. Right next to the stairs leading down to the fog gate. You must have opened his cell cage (requires Mystery Key or Master Key) back at Undead Parish then talk to him in Firelink Shrine to be able to summon him. His Soul Sign is near the corpse containing the Heavy Crossbow. Lautrec and Solaire may both got stuck behind the fog gate, and as a result the Gaping Dragon kept running into the door, trying to attack them, leaving it wide open for attack. Crawl - Crawls in a mostly straight line, tracking slightly. Ignores pillars, has long range. Raise Torso - Raises torso off the ground and assumes an upright position. Does this after Crawl attack or if there are no targets in front of it. Grab - Attempts to grab you with either hand. If successful, chomps on you for a lot of damage and throws you to the ground. Quickly alternate shoulder buttons to escape. Swipe - Swings left foreleg, short range, only uses while close. Tail Swipe - Moves tail slowly to one side and executes a quick swipe. High damage, can still use if tail has been cut but range is severely reduced. Acid - Wriggles its torso and releases a large pool of acid that expands rapidly. Will severely damage equipment, avoid by running in the opposite direction. The pool disappears upon reaching max range. Flying Smash - Flies up and attempts to smash down on you. Stomping - Stomps the ground three times with left foreleg. Slam Attack - Slams torso on the ground, reverting to prone position. Make sure to kill the Channeler at the top before entering the boss fog (see Depths for location), he will empower the boss and cast Soul Arrow and Heavy Soul Arrow at you making the fight a lot more difficult. Summoning NPC help for this fight is not recommended, they increase the boss health but do little damage and die quickly, plus the boss behaves unpredictably. Having the Repairbox by this point is highly recommended as if you are hit by the acid attack you will either have to swap out your equipment (at least a different weapon) or repair it. Medium or light encumbrance is recommended, stay out of range while it is upright and bait out its slam attack. While it is prone, stay in front of it but slightly off to one side, so it will still use its crawl attack and giving you enough room to run to the side to avoid it. Watch for its acid attack, running directly away from it should get you out of range. Stay back and wait for a charge attack, then dodge and run to the tail. Attack until almost out of stamina, then run away. Repeat. Blocking its crawl and upright attacks is not feasible and it is a very simple matter to avoid all damage from this boss. Sometimes it will chase you around while upright, just keep running and do not let it hit you. Try to put yourself between it and a long stretch of the arena to encourage it to slam down. If you wish to fight it while upright you can run to the right of it with a shield up (you may have to dodge a grab) and get a few attacks in. Since it turns slowly it will usually use its flying attack, run away and repeat. This is riskier but potentially a bit faster. An alternative is to use Iron Flesh and just tank it, however this is a novel method and does not protect you against the grab attack or acid. Run to the side of the crawl attack and attack its rear leg as it returns to its upright position. You should be able to expend your entire stamina bar and still have enough time to walk away. Attacking from the left side (the dragon's right) it is less likely to use its tail sweep. Note as you should not be blocking anything, you should two-hand your weapon for additional damage. You can get a few attacks in on its head with good positioning as it slams down, but be careful of the impending crawl attack. Same as melee, bait out the crawl and fire away. Has the advantage of being able to attack during the crawl as long as you are sure you are out of its path. Solaire and/or Lautrec can be summoned to distract the dragon however this will increase its health and dodging is a simple matter without them. The pillars offer zero protection so don't bother hiding behind them. There is also a drop on one side of the arena but there is so much room it is not an inconvenience. Domhnall of Zena sells 3 Gold Pine Resins for 1,000 souls each which add lightning damage to your right-hand weapon (if it is enchantable) causing it to deal significantly more damage. To cut off a tail it's necessary to deal a certain amount of damage against it. The HP of the tail increases with higher NG cycles and is based on the HP of the respective enemy. In case of the Gaping Dragon, the tail has about 11.58% of his HP. After the crawl attack it will spend a lot of time returning to its upright position. Use this time to get hits on its tail, preferably with a vertical attack. Note if using the Drake Sword that its heavy two-handed attack consumes durability, so only use light attacks. 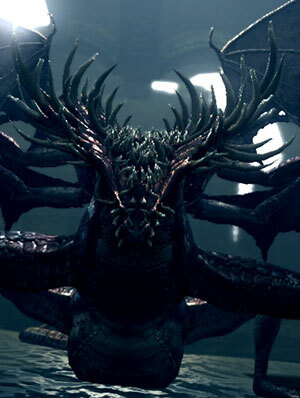 It is possible to skip the Gaping Dragon, since its defeat is only required to gain access to Blighttown, which ultimately leads to Quelaag's Domain. 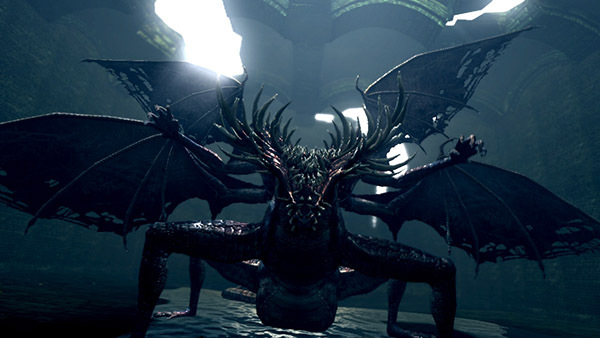 To gain access to Blighttown without defeating the Gaping Dragon (and without the Master Key), the player can travel to the Undead Parish, then to Darkroot Garden, then to Darkroot Basin. In Darkroot Basin, take the passage to Valley of Drakes. The player can then either fight, or run to the left past the Drakes and up to the back entrance to Blighttown. (Here the player can also enter Blighttown and get the key to New Londo Ruins to open that passageway for easier access from Firelink Shrine). Note that the large door to the Depths can only be opened from the side of the Depths, so if it is not unlocked, it will be a dead end.